After a false alarm in April, the saga of this update is drawing to close. The Verizon update for Galaxy S7 G930V Oreo is ready, and you can install it on your device. Verizon posted the changelog for this update, and the software build is G930VVRU4CRE5 for the Galaxy S7 and G935VVRU4CRE5 for the Galaxy S7 Edge. Android 8.0 Oreo update on Galaxy S7 G930V brings native autofill to help with your passwords, background limits that optimize the performance of the device, picture-in-mode for some app like Youtube and the notification dots. Notification dots on your icon let you check the notifications when available. Samsung has also included dual messenger features which allow users to log in to two accounts for the same chat app. Also, you can launch two apps at once with app pairs. An updated SmartThings app and a new phone UI is something great on this build. The update is being rolled via OTA (Over-the-air), and the customers started receiving it. However, if you are in a Custom ROM, or your device is rooted, you won’t be eligible to get the OTA package. 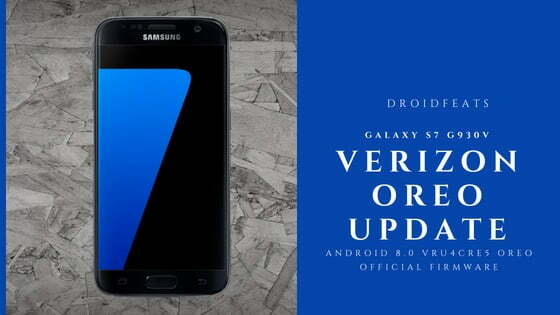 In that case, you can follow our tutorial below on How to update Verizon Galaxy S7 G930V to VRU4CRE5 Android 8.0 Oreo Official Firmware. We have a manual step-by-step guide to install the update via Odin tool, read ahead — and also you can root your device on this firmware. Generally, we recommend factory reset whenever installing a major system update. Take this opportunity to clean your aged Galaxy S7 and upgrade to the latest firmware. Once you update your phone using our tutorial, all the unnecessary files and cache junks will be cleaned with a new OS. The update comes in at 3 GB (approx) and comes with April 2018 Security patch. But before starting the tutorial, please make sure to backup your important files. Once you are sure that you have completely backed up your data, install VRU4CRE5 Android 8.0 on Verizon Galaxy S7 G930V using Odin. All the download links are given below — read ahead and grab them all to start the tutorial. Verizon Wireless announched the VRU4CRE5 software update. This update is tested to optimize the performance of the device, fix the known issues, and apply the latest security patches. This software update brings the latest Android Oreo OS, tools for you to improve your productivity such as App pair, Dual Messenger, and high contrast keyboard as well as UI improvements to your phone dialer. The latest Android security patch is also included. Android Oreo helps minimize background activity in the apps you use least, providing better device performance. Autofill remembers logins and passwords for quick access to your favorite apps. Lets you to see two apps at once for easier multitasking. Press the notification dots to quickly scan what’s new, and clear them by swiping away. Your Galaxy S7 has Dual Messenger capability, letting you use 2 accounts on the same chat app. Keep separate accounts for work and home, but on the same phone. You can find Dual Messenger in Settings> Advanced features. SmartThings app allows you to monitor and control a wider range of devices, such as Samsung Smart TVs, home appliances, and SmartThings-compatible devices (replaces Quick connect). This firmware is device specific and will work only on Verizon Samsung Galaxy S7. Please do not try with any other variant on Samsung devices. Make sure you have correctly installed Verizon Galaxy S7 USB Driver on your computer. If not, please download it from our USB Driver Section below and install it correctly. Otherwise, your computer will not be able to detect your device. The tutorial will use Odin flash tool. We have mentioned the full step-by-step instructions on How to install VRU4CRE5 Android 8.0 Oreo. If you are entirely new to rooting, flashing a Custom ROM or an Official Firmware, please read the entire tutorial once before actually performing it on your device. Please read the tutorial from the link above to install VRU4CRE5 Android 8.0 Oreo. The procedure has been described properly with screenshots. If you got stuck somewhere, drop your comment below, and we will help you as soon as possible.